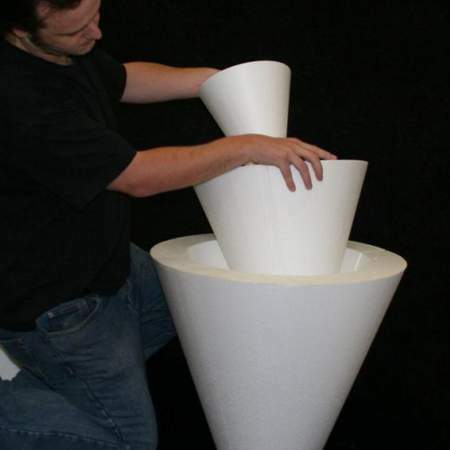 These polystyrene "tiered cone trees" are available from 900mm ( approx 3 foot ) to 2700mm ( approx 9 foot ) high. They can create a unique look to any window display. The different levels come packed separately,and on most sizes pack inside each other, which makes shipping very economic. The bottom edges of the tree sections are reinforced to help prevent chipping and the whole tree is coated with a special coating which increases its strength and also its resistance to fire. These simple style straight edge cone trees are available from 600mm ( approx 2 foot ) to 2400mm ( approx 8 foot). As standard, the base diameter is half the height, but if you need something different just ask for a quote. These trees are supplied as standard with a thin base, that lifts them a small amount of the floor. They will however work equally well placed straight on the floor. 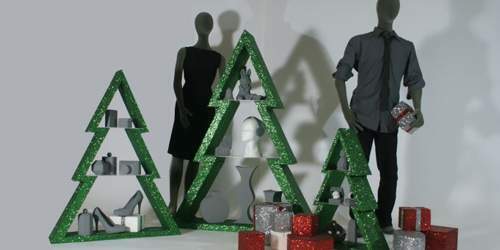 Our Christmas tree shelves make great floor standing decorations and are a fabulous way to display merchandise. 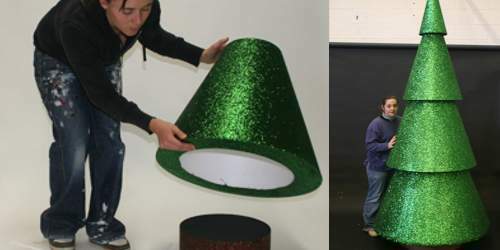 The eye catching tree does not need to be traditional green as we have a range of glitter colours to choose from. We can also supply a back to the shelved, this can be glittered or painted as required. 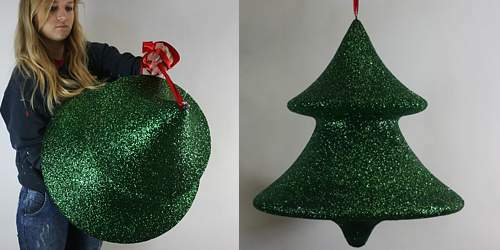 Our new "spinning top style" hanging Christmas trees range from 200mm to 1200 mm high. 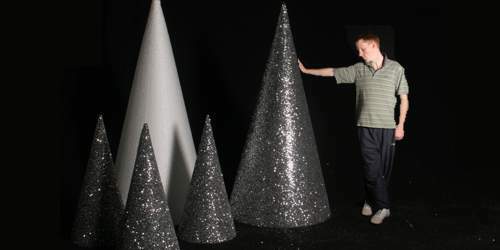 These christmas trees are available in our full range of coloured glitters, and make a unique alternative to baubles and other hanging decorations. These trees all come fitted with secure hanging points at the top.